The Chicago's sports scene includes several major professional teams, such as baseball, basketball and American football's Chicago Bears. All of these sports are incredibly popular and matches are played regularly. The local newspapers provide a sports section listing daily local events and there are many popular spectator activities throughout Illinois. There are around 22 miles / 35 km of paths nearby Lake Michigan and these have been widened for cyclists and rollerskaters in Chicago. The paths are well used at the weekends and bicycles and rollerblades can be rented at shops close to the lake and in Chicago. With such a large number of city parks and gardens, jogging is one of the most popular pastimes and sports in Chicago. There is also fitness / sports equipment available at Lincoln Park, near to Diversey Park. The Chicago Marathon takes place in October and attracts a large number of participants from all over the world, together with thousands of cheering spectators. There are around 30 beaches next to Lake Michigan with a lifeguard service, running from the end of May to the beginning of September. 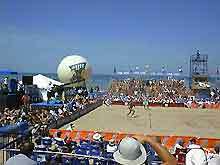 The water in Lake Michigan warms up quickly during the summer and the nearby beaches are popular areas for many types of outdoor activities, including beach volleyball, Frisbee and sunbathing. Regular boat excursions run from beneath Michigan Avenue Bridge and these provide an excellent way to see the skyline from a distance. Most boat tours run between April to October and there are also other boat trips and guided tours that leave from Navy Pier. Tennis courts in Chicago are available at the Daley Bicentennial Plaza in Grant Park and advance booking is usually required. 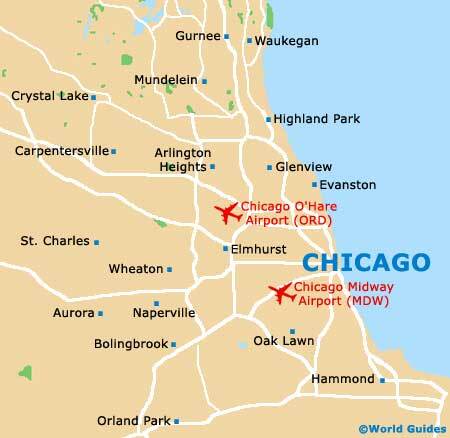 There are also a number of excellent golf courses in the area and these include the 9-hole Illinois Center Golf Course and Driving Range, which is situated at 221 North Columbus Drive, Chicago. Chicago is home to a number of large bowling lanes and Miami Bowl on 5023 Archer Street has over 80 lanes and is own of the largest bowling venues in the world. Bowling is a social event and is a popular pastime for families. Food and drink are available at all of Chicago's bowling sports centers. The baseball season in America runs from April to October and baseball is one of the most popular spectator sports in the city. 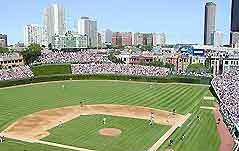 Regular baseball games are held at the White Sox Park and at Wrigley Field, which is one of the oldest stadiums in America. The world-famous Chicago Bears play American football at the Soldier Field and many World Cup football sports matches are played here. American football attracts a large following and the season runs from September to December. The Chicago Bulls are one of the city's most loved sports and the Bulls have won numerous basketball competitions. The Bulls play regular basketball matches at the United Sports Center. Soccer is becoming an increasingly popular sport in Chicago and the city has its own soccer team, the Chicago Stingers Their symbol is a wasp and they play regular football matches at The Hive in Forest View Park, 2121 South Goebbert Road, in Arlington Heights. Tickets are usually available for most matches. The Chicago Black Hawks are the city's main ice hockey team and play regular games at the ice skating rink in the United Sports Center. They are also one of the city's oldest sports' teams and were actually founded in 1926.